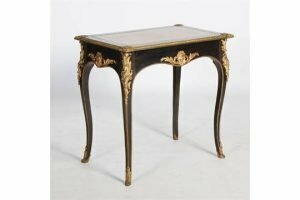 A 19th century ebony and gilt metal mounted writing table, the rectangular top with gilt tooled leather insert, above a serpentine frieze set with mask and scroll mounts, raised on four cabriole supports with foliate cast mounts trailing to sabots. 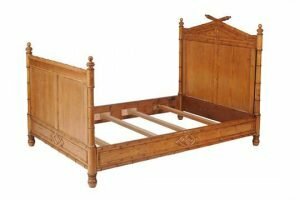 A late Victorian pine simulated bamboo bedstead, circa 1900, the panelled headboard surmounted an arched crest applied imitation bamboo turning, the base and sides similarly decorated. 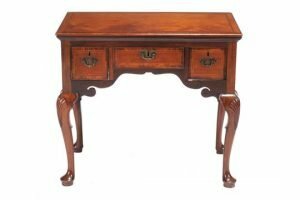 A mahogany side table in George II style, the rectangular top above three drawers, on tapering cabriole legs surmounted by carved shell motifs. 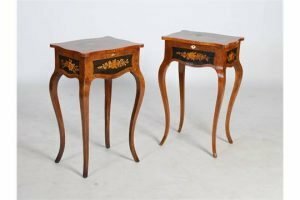 A pair of Victorian walnut and marquetry inlaid work tables, the hinged rectangular tops opening to plain interiors, raised on slender cabriole supports. 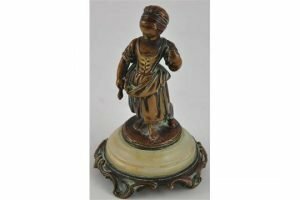 A small late 19th Century bronze of a young girl, raised on an onyx mounted Rococo base. 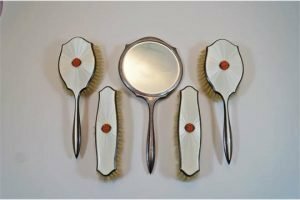 An Art Deco silver, enamel, coral and marcasite five piece dressing table set, Birmingham 1934, the hand mirror, a pair of hair brushes and pair of clothes brushes, in white enamel, set to the centre by a carved coral cabochon set within marcasite. 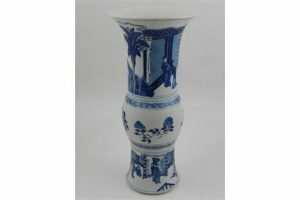 A Chinese blue and white Gu shaped vase, decorated with noblemen in courtyard settings, with stylised flowers and foliage to centre. 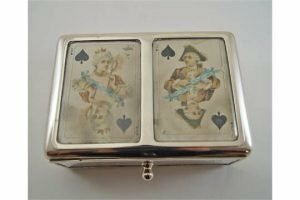 A late Victorian silver card box, by William Comyns, London 1899, the glazed top mounted with playing cards, with an inscribed pull out drawer. 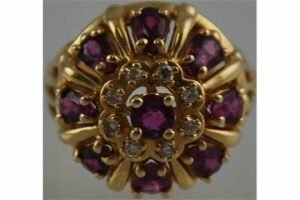 A ruby and diamond flower head cluster ring, claw set in a 9 carat yellow gold band. 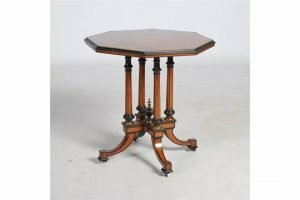 A Victorian amboyna, gilt metal mounted and ebonized octagonal shaped occasional table, the shaped top raised on four tapered cylindrical supports, with four down swept supports resting on white ceramic casters. 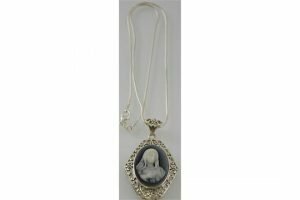 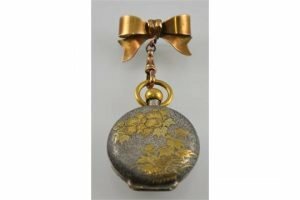 A silver necklace, set with a ceramic plaque depicting the virgin Mary. 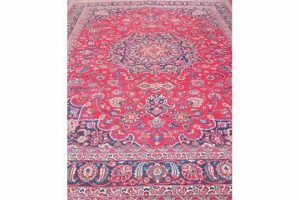 A handmade Turkish Gheysari red ground rug, with central medallion and overall foliate design. 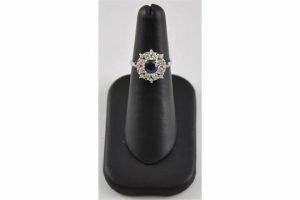 An 18 carat white gold, sapphire and diamond flower head cluster ring, in a high wire mount. 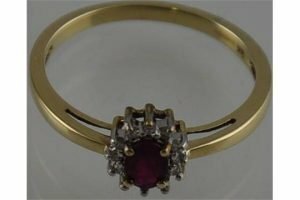 A ruby and diamond dress ring of crown form, claw set in a 14k yellow gold band. 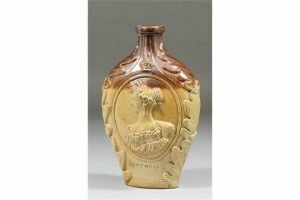 An early Victorian brown salt glazed stoneware flask of flattened baluster form, moulded with portraits of Victoria and Duchess of Kent, within a moulded oak leaf border. 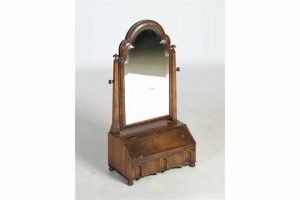 A Continental walnut dressing table mirror, the shaped bevelled mirror plate above a hinged fall front resting on loppers, opening to a fitted interior, above a concave fronted drawer, raised on bun feet. 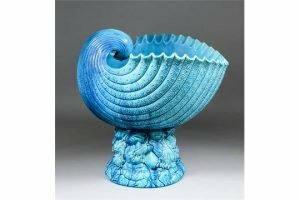 A turquoise glazed pottery jardiniere, modelled as a nautilus shell supported on a rocky mound. 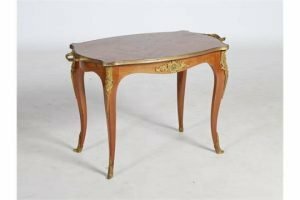 A Louis XV style mahogany and gilt metal mounted occasional table, the shaped oval top with twin handles, raised on four cabriole supports with foliate cast mounts. 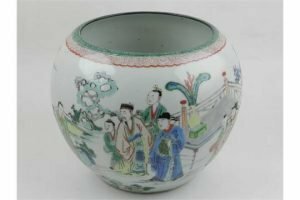 A Chinese Republic period famille verte bowl, decorated with noblemen in a garden landscape.